Have a lovely lady date! SOunds so fun! 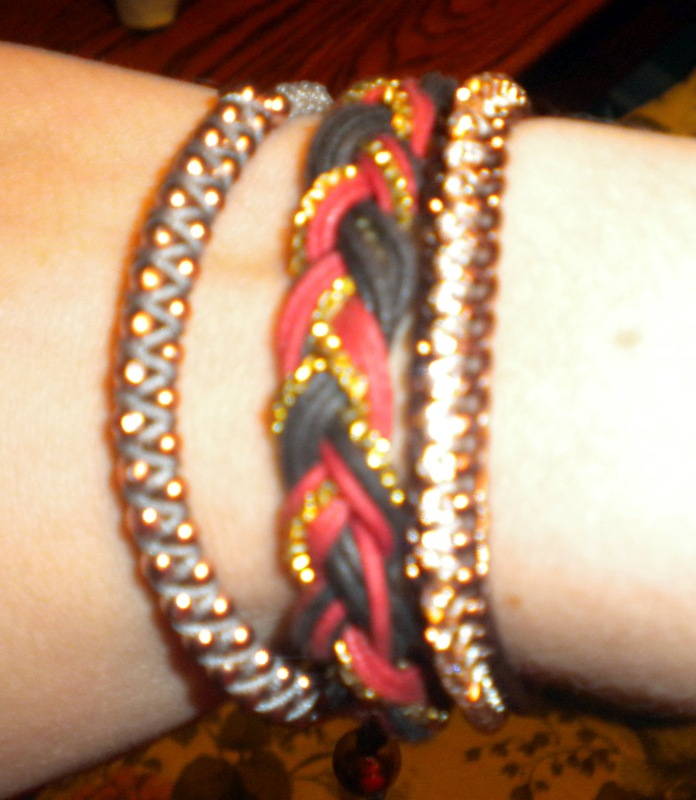 And yay -- love those bracelets. I think your bright, colorful outfit matches your sunny, cheerful mood today. :) You're the cutest. It's funny how our moods can swing so wildly in so short a period of time. That happens to me frequently. Love this outfit and so thrilled to hear of your meetup! Details afterward, please! yay, i'm so glad you're having a better day! that color top looks amazing on you! i love it. i am trying to see if i can make tonight to see you gals, but it's not looking hopeful right now! have fun, though!! No worries - we have happy hour coming up next week too! So many fun meetup opportunities! I love all of the colors in this outfit, perfect for early atumn! Have fun tonight girly! Love the outfit dear, and I'm so glad you are having a better day today! Enjoy Cupcake tonight!! I love that place! Glad to hear you're in a better mood, Beth! Your arm party is so cute. Hope you have fun on your blogger date tonight! Beth I LOVE this skirt such a beautiful pattern! And what... there is a newly reopened World Market?!?!?! I love that place!!!!! Yes! It's in Roseville, across from Rosedale in it's exact old spot!! I hear it re-opened in Edina too. So glad you're having a better day! I'm sure all of the lovely bright colors in your ensemble help that a bit :) You look absolutely stunning! I LOVE Ragstock. I have so many pieces from there that I wear all the time. Loving how you belted your tiny waist too! Looks so chic. It's a wonderful thing to wake up in a bright, happy mood. And your outfit definitely shows that off. I love the bold print and bright red sweater paired together, Beth! Hope you have a wonderful time with your blogger meet-up tonight as well. And I am definitely a fan of Disqus commenting. But that's just me. Hope it works out for everyone! So far I think it's working - Blogger and Disqus aren't exactly agreeing on comment count, but I'll give it a little bit! OK so many things! first, I am so excited too! Can't wait! Also, if this is what you're wearing, it'll be no problem spotting you. I just love how bright and happy your outfit is today! Also, loooving those bracelets (all of them!) and lastlyyyyyy, I have never been to World Market, I'll have to check it out! OHWOW this is so cute! Do I say that too much? Seriously though I love the blouse, it really pops the print of the skirt. We have a World Market one town over. They've got some neat stuff, but imo I find them to be quite pricey. Ours seems pretty small and limited. Disqus has gotten better, but I still prefer to keep blogger comments on my blog and use email to reply to people when possible. LOL, yes I will have the orange shirt on for sure - might switch to some skinny jeans for evening, but I promise to keep the orange!! LOL. And I'm not sure on Disqus yet. We'll see, there's another platform I might try too. Oh and you'd love World Market! I understand your thoughts on Disqus - and I'm still not sold myself but I'm giving it the rest of today at least! There's another comment platform Mr. Monkey found me I might try instead. I appreciate the feedback though! Oh and yes - World Market can be spendy on certain things - but on others (like cheap jewelry) not too bad! Just depends on what you're looking at! I love the color of that top and the skirt is so pretty! I heard World Market was coming back but I didn't know it happened yet! I love their jewelry! I have found since Disqus updated that I have fewer issues, and I remember to check the dashboard now which has replies to comments. Yeah I don't know if ours actually has jewelry or not. It's been awhile since I last went in and I tend to glaze over at all the food and spend too much on tasty things. I'm glad you're feeling better. You look SO cute! Your evening sounds like fun, too! Red is your color, Beth. Fabulous outfit - you look great in that red. Love the outfit (and I love the bracelets)!! Okay, this is definitely one of my favorites. The colors, pattern and fit are perfect! You look stunning :) Love your bracelets too! I love that they reopened World Market - that place rocks! And so does that beautiful skirt! A favorite meal and some TV is a great mood lifter :) I love that skirt - the print and colors are so pretty! Fantastic skirt and braided bracelet, I love the colors and patterns! i love this look! probably because it something i could see myself wearing, but i think the belted cardigan over the full skirt is very flattering on you! btw, i am a big proponent of disqus so i hope you keep it around!